Although the Portuguese came to Kerala to buy spices but at the same time they also brought a few things with to India from South America, and Cashew nut is one such thing that came here from Brazil. Cashew Feni, prepared from Cashew apple is a popular drink in Goa but it is not so popular here and the focus remains on nuts. You can get best quality Cahsew nuts all around the state. You can even taste before buying them as there are a number of qualities available. You must not try to leave the state before getting your hands on the world's best spices. Some of the best buys here include cardamom, black pepper, turmeric, cinnamon and more. 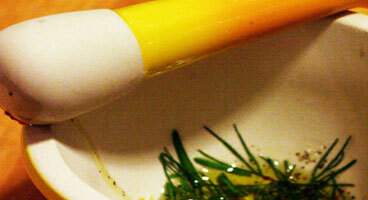 These spices are not only the best but they are available at reasonable rates. You can buy these spices in huge quality, and store them in airtight jar to keep them unspoilt. Best quality spices are available in Kumily near Thekkady. Always thought that the best tea is available in Darjeeling? Well, that is not the case. Along with Assam and Darjeeling, the Western Ghats were the place where the concept of tea selling stalls came up. The Nilgiri tea is also a favorite of a number of people and it also gives a lovely chocolate color to your tea. 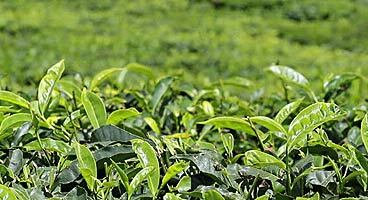 Munnar, Wayand and Thekkady grow best tea in Kerala. If you are a coffee addict, then coffee grown in Kerala is just your brew. It is one of the world's best quality. The locals adore their 'Filter Kapi (Cofee)', served in a small steel glass. The production of coffee needs temperature of 23°C to 28°C and rainfall up to 60 to 80 inches on an average annually. Kerala has a favorable climate along with a fairly dry spell of 70 to 90 days. Cultivated in the pleasant hills, the Malabar coffee is something you must try. The second most famous plant in Kerala, Banana is grown in several types here, more than anywhere in the world. Probably, banana chips is the original chips all around the globe. 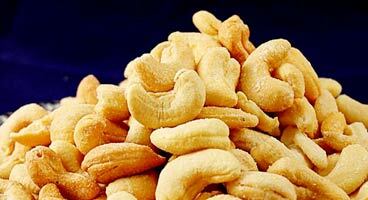 Banana chips in Kerala are available in various forms- salted, sweet, crunch, spicy and more. Locally known as Upperi or Nenthra-kaaya oopperi, these chips are made from ripe as well as raw bananas. Again, keep them safe in an air-tight container. Kerala state is extremely popular for being home to extremely talented artisans, experts in making utility items as well as stunning showpieces from materials like wood, metals, coconuts etc. A huge number of handicrafts that are made in Kerala are not available anywhere else in the country, becoming a great representation of range and cultural abundance of the state. Did you known that Kerala is named after Coconut, Kerala (coconut) + Alam (Home), translating to 'Home to Coconut', so how can say goodbye to Kerala without purchasing a coconut product. The whole state is dotted by coconut trees. Every delicacy of Kerala cuisine has coconut in it, in one or the other form. 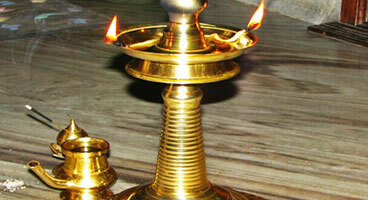 Several handicraft items are made from a fiber named coir, which is derived from coconut husk. You can buy show pieces and carpets for your house. Kerala is blessed with the Arabian Sea at various cities, towns and locations. With the shores come seashells. These beautiful offerings of the sea are transformed into stunning showpieces like wall-hangings and other decorative stuff. These are made from different types of shells such as oyster shells, conch shells and cowrie shells, which was earlier used as money. There is a vast variety of seashell decorative pieces. Take home beautiful reminders of the seashores of this haven on Earth. Kasava and Mundu are traditional handmade cotton apparels that have golden borders, and are worn by Malayalee males and females. As gold thread is pretty costly, green-golden colored thread is also used. The men wear Mundu in all festivals and traditional functions. While the females earlier used to wear a saree in routine, another option is to wear a skirt and a top, which is prepared from same material and stitched in the form of a Ghagra-Choli, generally worn by girls. Wooden idols of different Hindu gods, Gautama Buddha, and Jesus Christ are available in the markets of Kerala. Try to be careful that what you are laying your hands on is either a copy of an antique (carrying real antiques out of India is not allowed) or is a brand new one. Other wooden items include figures of tigers, elephants, Kathakali dancers and more. Kathakali, a traditional dance form of Kerala, is one of the best classical dances of India. In Kerala, you can easily get souvenirs related to Kathakali. Some of them include hanging showpieces, fridge magnets as well as Kathakali Masks. Before leaving Kerala, do buy such souvenirs. The colorful pieces bring a burst of color wherever you put them. 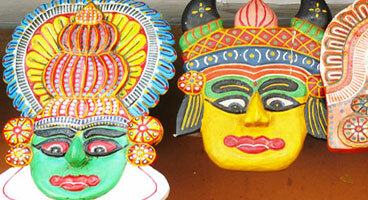 The dramatic extravagant masks are a wonderful memory for your vacation in Kerala. The bazaars of Kerala sell some of the world's finest wooden chests. These wooden chests are locally known as Nettur casket. These beautifully-carved masterpieces can be used for several purposes such as a decorative piece, a jewelry box or for storing other valuables. Feel precious like the box when you have one in your kitty. You can also take it home as a souvenir or gift for someone to remember the luxury holiday you spent in Kerala. Kerala is extremely popular for its different kinds of boats, one of them is ChundamVallam - a snake boat used in the races, and the other one is Urus- boats used for cargo and human transportation in high seas. You cannot take the real ones home but you can surely buy their models. Along with this, you can also get models of houseboats and spice boats. The Nilavilakku denotes the Hindu trinity of Brahma/Vishnu/Shiva. The base represents Brahma, the stem represents Vishnu, the head represents Shiva, the wicks represent Parvathi and the heat represents Lakshmi. The Hindu lamp is so beautiful in concept and design. Used in homes, during ceremonial functions in temples, is kept in the courtyard of traditional Kerala homes and at the hotel's reception. These lamps are available in all sizes, from small ones to really extremely bigger ones. If you are buying the best quality whole spices for Kerala, how can you not buy a Mortar or a masala grinder and Pestle. These manual grinders are available in different shapes are made from several materials such as marble and metals like iron and more. One can even use them as a show piece in your home. 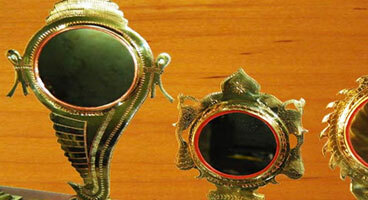 A special metal mirror made in Kerala is extremely hard to find anywhere else, even if you find them, they might be genuine. These mirrors are made only by one family from a secret alloy. Only the family members are aware of its composition. The specialty of this mirror is that it has a shiny surface but the polish is not silver like normal mirrors. Kerala is the hub for some precious jewelry. It is said that the foreign merchants who came to India to buy spices, gave silver, golden and precious stone in return instead of money. Since then, all this has stayed here. 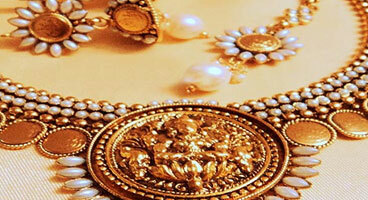 Explore jewelry pieces like trinklets, huge pure gold ornaments, etc. Some extremely stunning pieces of jewelry are waiting for you in Kerala. And, yes, do not forget to buy a proper receipt of your jewelry and you must buy your gold from a reputed jewelry shop. These are huge ornaments that are used to embellish elephants at the time of temple processions. The real ornaments are made in Gold, but its stunning replicas are available that can be used as showpieces in your car or house, as per the size, from a few inches to life-size ornaments. Because of the spices that it produces, Kerala also produces some of the best perfumes and aromatic oils. These oils are not just for cosmetic purposes but their best feature is that they can also be used in treating certain ailments such as back pain, chronic dermatitis, migraine, joint pain, Asthma and more. How about a perfume that can treat your headache, nice idea, isn't it? Beautiful colorful umbrellas of Kerala are going to come handy as they would be saving you from heavy constant rains or the hot tropical sun of Kerala. Alleppey in Kerala is not only known to be the best backwater destination of Kerala but is also known as the 'Umbrella capital of India'. You can get your hands on umbrellas in all shapes, designs and shapes. Just like any other famous destination, Kerala also sells its own share of T-shirts, with the popular slogan 'God's Own Country' written on it. They are available in all sizes.